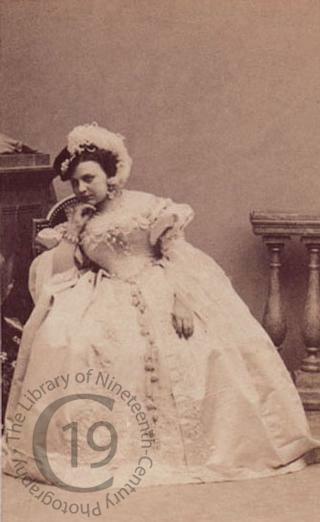 Born in Brussels on 1 December 1834, the Belgian soprano/ mezzo Pauline Leuters had a career even greater than that of her husband, Louis Guéymard, who was the leading tenor at the Paris Opéra until 1868. She made her début on 7 October 1854 under her first husband’s name, Deligne. During her career, she created several roles. In the 1860’s, she appeared as Gilda in Massé’s La Mule de Pedro (1863) and as Myrrha in La Coupe du Roi de Thulé, as Lelia in David’s Herculanum (1859), as Juliette in Bellini’s Roméo et Juliette (1859), as Laura in Poniatowski’s Pierre De Médicis (1860), as La Reine in Gounod’s La Reine de Saba (1862), as Alde in Mermet’s Roland à Roncevaux (1864). She also created Eboli in Verdi’s Don Carlos (1867) and Gertrude in Thomas’s Hamlet (1868). She is probably seen here dressed for the role of Laura in Prince Poniatowski’s Pierre de Médicis, presented for the first time by the Paris-Opéra in the Salle Le Peletier on 9 March 1860.